Louis Moult is on his way to Preston. 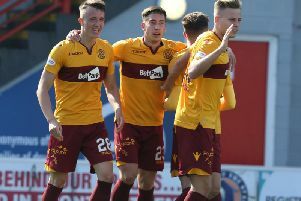 Motherwell have confirmed that talisman striker Louis Moult is set to leave the Steelmen for Preston North End. The former Stoke City forward, whose contract would have run out in Scotland at the end of the season, was free to agree a pre-contract from that time with any club outside the country. However, after discussions between the clubs, an undisclosed fee has been agreed that will see the 25-year-old complete a move on the opening day of 2018. The player has agreed to sign a three-and-a-half year deal with the Lilywhites and subject to national and international clearance will be eligible to pull on the North End shirt for the first time in the Emirates FA Cup tie at Wycombe Wanderers on Saturday 6th January.